But the tears on her cheeks are from laughter. "A secret crashing place when all else had failed was The Villa Borghese Catacombs! You got through the front gate, turned left and then snuck up a little hill . There was the tiniest entrance to a cave, well shielded from view, so you really had to know where to look. Inside was a great hall of a cavern and offshoot tunnels. We slept there half a dozen times or so: smoking, playing guitars and making love. During one bout of passion my beautiful American girl decided to reveal that she had "balled Frank Zappa". Needless to say that spurred on this young English stud!!! 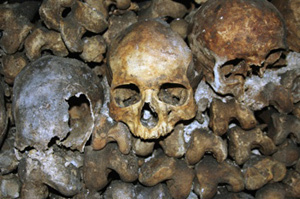 Now then, this end of the Catacombs was riddled with tunnels: miles away from the tourist entrance, so we felt safe. Then POW. Mayhem. Uniforms, flashing lights and the brave Carabinieri dressed in their shinys (they do love a flash uniform) and the next thing you know is me and my hippy mates running like hell into the dark burial grounds, trying to find a shelf to hide on. If you were lucky you'd find one with an old bag of bones to hide behind. Any way I survived, but they caught me a few times on the Steps and gave me lodgings in Regina Coeli and 2 folio de vias. They took me and San Fransisco Pete to the border, booted us out… and Ha Ha - I had girlfriends in Nice, so we just snuck back a few weeks later . . . . "